When Facebook Inc. (FB.O) reported fourth-quarter results at the end of January, it reached a new milestone. The company generated more than US$50 billion in annual revenue for the first time, managing to do so before reaching its 15th birthday. Not only was it an impressive financial feat, it’s pretty much unprecedented in the history of American business. I was able to reach that conclusion, in part, because of a tweet. I shared Facebook’s milestone on Twitter, comparing how long it took the company to reach US$50 billion with several other high profile companies. Silicon Valley veteran Paul Graham, who used to run the influential startup incubator Y Combinator (which has helped launch companies such as Dropbox, Airbnb, Stripe and Reddit), tweeted that it would helpful to see a bigger list of companies, along with their founding dates. It would be very interesting to see these plotted by founding date, with more companies included. Incidentally, this acceleration in growth rates, combined with the fact that founders own more of their companies, explains a lot of the increase in economic inequality. I thought it was a great idea, so I got started. And what I discovered was truly mind blowing. I screened the S&P 500, perhaps the world’s most influential stock market index, for companies that generate more than US$50 billion in annual revenue. What I found was a group of nearly 60 well-known names, some whose earliest days go back more than 200 years. 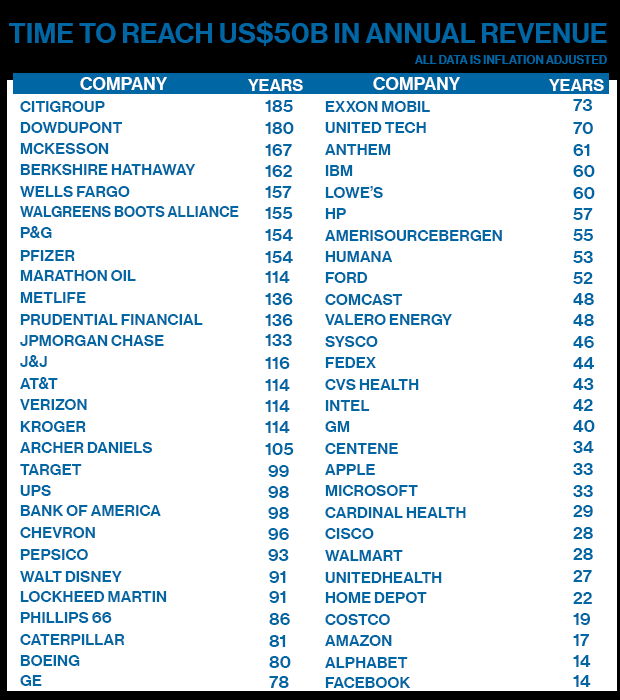 When I crunched the numbers, I found that on an inflation adjusted basis, it took most of these massive businesses more than 50 years to reach the US$50 billion revenue milestone. And while we think of Facebook as a highly acquisitive company after buying firms like Instagram and WhatsApp, keep in mind that most of the companies that generate as much revenue as Facebook got there through decades of mergers and acquisitions. In the end, there are only two companies in this elite group that hit the US$50 billion milestone in less than 15 years: Facebook and Alphabet Inc. That compares to an average of more than 80 years for companies in this group to reach US$50 billion. As for third place, that goes to Amazon.com Inc., which reached US$50 billion in 17 years and just recently reported more than $200 billion in annual revenue for the first time. Perhaps, then, it’s no surprise that the founders of Amazon (Jeff Bezos), Facebook (Mark Zuckerberg) and Google (Larry Page and Sergey Brin) are among the top 10 richest people in the world, with a combined net worth of more than US$300 billion.